Join CNA to build and benefit from your network from the moment you arrive on campus and all through your career. 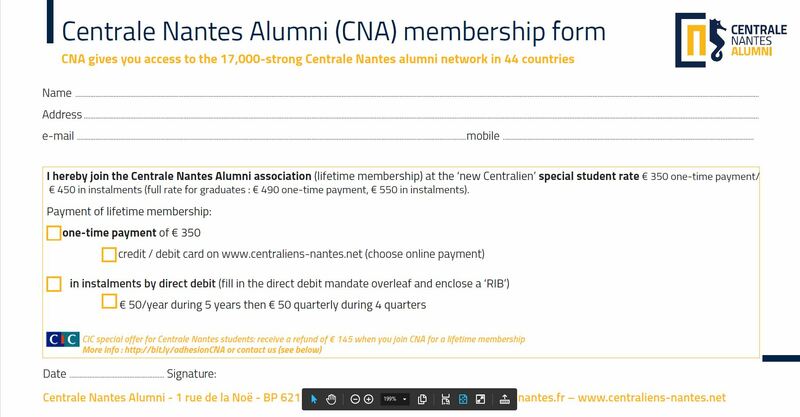 Membership of Centrale Nantes Alumni means belonging to a network of of 100,000 alumni from the Ecoles Centrale and Supélec. Join Centrale Nantes Alumni, and benefit from career services and mentoring from your first day on campus and throughout your entire career. 450 events each year to enliven and enhancethe network. You’ll have direct access to activities and InterCentrales business groups to build your quality network and your career plan. Alumni members benefit from a 20% discount on Executive Education tariffs. Join CNA (lifetime membership) at the "new Centralien" special student rate of €750 (full rate 850€). Fill out the membership form now. New students who sign up in their first year at Centrale Nantes benefit from a discounted rate.